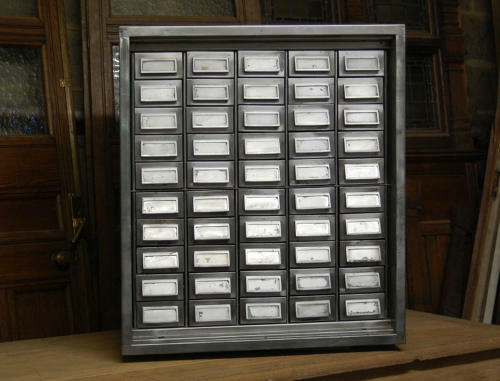 A fantastic, hand polished, reclaimed and refurbished metal drawer unit with 50 small, pull out drawers. The unit has a striking industrial feel and has a high quality design, offering a stylish storage solution. The drawers have handles with integrated label holder and ply drawer inserts, The unit is a heavy, well made, item that has great style and has been refurbished to a very high standard. All drawers are useable and the original paint has been removed and the unit hand polished to reveal a high shine finish. As with all reclaimed items, there are a few signs of wear, such as slight scratches and marks. The drawers have some character marks within the metal and this authenticates the units, industrial, reclaimed look that is hugely popular at present. The unit is solid and sturdy and in very good condition. The item could make a statement piece within a home or a business and the drawers would be perfect for storage of papers, cosmetics or other such items. A very interesting and stylistic item.